Good morning! How are you? I'm feeling cheered by the wonderful box of Christmas I received yesterday from Elizabeth! Can you believe how adorable these all are? Well duh, you've been around so yes, you can believe it! I feel so lucky to have this adorable clothes pin bag. I've seen a ton of them on Pinterest and I always think I'll make one, but then I never do.. now I don't have to. Gosh, super cute, although Elizabeth says that the pattern is very frustrating. Anyway, I couldn't be more thrilled. In her usual Elizabeth style, it's all so nicely made, every little detail perfect! A lovely treasure! 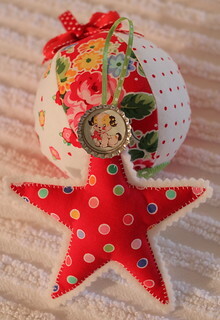 Oh how cute are these darling Christmas ornaments. Love them both, that bottle cap pup is killing me. Perfect timing, I can still enjoy them on the tree, then they'll be packed away safe with all the Christmas decorations so I will find them again next year! Ok, it's New Year's Eve... tomorrow we start a brand spanking new year THANK GOODNESS. Be safe out there!! Thank you all for your support this past year, your friendship and encouragement means so much to me! So much gorgeousness! I am saving up to buy my Picnic fabrics and can barely wait! I think I would have to keep the round ball out all year hanging from a lamp switch, so beautiful! Happy New Year to you and I look forward to sewing with you in 2014. Beautiful PKP makes! They look so gorgeous. Wishing you a Happy New Year! I'm thinking I need to find some reds...happy new year! I know it's been hard of late. Spring is just around the corner and hopefully I can finally get my rose bushes! No deer in this yard. Unnatural urge to do laundry………. Wow. 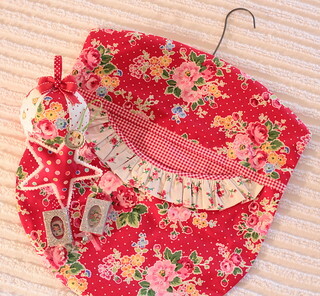 Very charming clothes pin bag!! Happy New Year to you and I'm hoping that in 2014 I bump into you somewhere in the Livermore area!! Happy New Year!!! Can't wait for more PKM adventures in 2014! Cute cute. Elizabeth is such a good creator. I really want to make her deer quilt. I think about it all the time. I gotta get back to feeling well so I can sit at my machine!!! Darling ornaments but that is just the cutest clothes pin bag ever. I have been wanting to make one for a long time. I might be inspired to hang clothes out again with such a cute bag. Happy New Year, Pam. I will be watching to see what great things you come up with this year. I enjoy your fabrics and creativity so much. Such cuteness, makes you want to redo the entire laundry room with Pam Kitty Fabrics!! Whoops, another idea! Happy New year Pam! It has been a long year in a lot respects, so let's move on!! Happy New Year's Pam! Your blog (and you) are always so bright and happy! Happy New Years Miss Pam---- you're always a bright spot and I know you'll continue to be! :) May 2014 be (as gramma used to say) a real corker!! YES use that iron...I spent YEARS "saving" things to use "later".....once I got a beautiful box of decorated sugar cubes when teas were all the rage, put them away because they were too pretty to use...came across them a few years later...ruined by age and probably ants....wish I would have enjoyed them while I could, lesson learned! I also had a beautiful camels hair coat years ago,,,,when it didnt fit me anymore I should have donated it but it was so beautiful I couldnt part with it, a ffew years later, went to donate it, and it had moth holes....lesson learned!!! !